Fairlands Valley Spartans’ Ladies track and field team, defending champions in the Eastern Masters Athletic Club League, have charged into the final of this year’s competition. The women were in the comfortable position of knowing they had already secured their position in the final at the previous match, winning the Central Division from Milton Keynes. However, they finished the divisional matches in style, taking victory over Milton Keynes at their home track. The final will see the team returning to the Stantonbury Campus in Milton Keynes on Sunday 23rd September, spectators welcome! The Men’s team have had a much improved season his time around and the main question at the last match was whether they could join the women in the final. They needed to be in front of Bedford and County Athletics Club by two and a half points for automatic qualification. They finished in a fine 2nd place on the night behind Milton Keynes but agonizingly only 2 points in front of Bedford and County Athletics Club. There are still places left in the final, and Fairlands Valley Spartans Men are still hoping to qualify for one of these spaces by being one of the best third places from the three divisions. Steve Mayfield had a very busy evening doing the 200m (2nd), Discus (2nd), Javelin, Long Jump and Pole Vault (3rd) plus relay. Yuko Gordon – 1st in LJ, 2nd 1 mile, 4th Javelin. 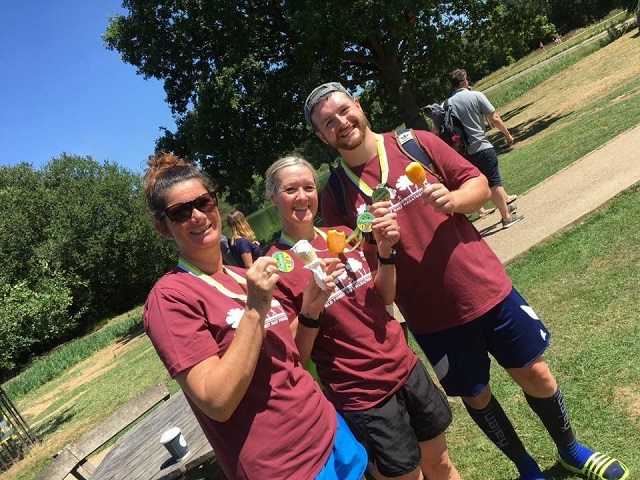 Sam Simmons was first Spartan to finish the Hatfield Forest Half, and in spite of the 30 degree heat ran a new PB of 2:13:05, beating his previous best at the distance by 80 seconds. He was joined by Julie Shadbolt who completed in 2:16:56 and Erica Grayson who finished in a time of 2:26:26. Roger Biggs continued his recovery from heart surgery with a Half Marathon on the trails of the Forest of Dean in Herefordshire. On a very hot sunny day, entirely run on hilly forest trails, Roger completed the 13.1 miles in a time of 2:51:34. Paul Holgate & Roger Biggs were in the capital on Tuesday evening to run a 10k in Regent’s Park. In good conditions, although a little warm for running, Paul finished in 56:59 and Roger 1:08:47. It was a very busy parkrun Saturday with Spartans running in 13 different locations up and down the country plus one Spartan was stateside. At Stevenage Spartans donned their stripes for the first Stripey Saturday of the month. Danny SCANLON was 6th in a new PB of 19:08. Tim Saban also got a PB running his 49th Parkrun of 20:49 (first in age category). Steve DOBNER ran San Francisco’s Chrissy Fields Parkrun in 36:28. The course starts on the San Francisco Bay trail and heads west towards the Golden Gate Bridge. In Windermere Erica Grayson ran Newby Bridge Parkrun, Paul Jennings joined 82 others running in Rochdale, Jim Brown was in North Yorkshire, Rowena Rutledge in Poole and Alison Shelley in Bodmin. Tracy Stiles and Monica SMITHSON ran the shady Rushmere course. Full details of all parkruns and times are below. Let’s see how many parkruns Spartans get to next week! A total of 392 runners took part. A total of 659 runners took part. A total of 247 runners took part. A total of 265 runners took part. A total of 278 runners took part. A total of 173 runners took part. A total of 190 runners took part.